Should Christians Challenge The Teaching Of Church Pastors? What should a believer do if they hear their pastor preaching error? Can Christians challenge the teaching of pastors? When the Apostle Paul and Silas were preaching the gospel in Thessalonica, the Jews hired thugs and instigated a riot because they were jealous, so the Thessalonica believer’s had to get Paul and Silas out of Thessalonica under the cover of darkness. It says, “The brothers immediately sent Paul and Silas away by night to Berea, and when they arrived they went into the Jewish synagogue” (Acts 17:10), however the Jews in Berea were not like the Jews in Thessalonica because “these Jews were more noble than those in Thessalonica; they received the word with all eagerness, examining the Scriptures daily to see if these things were so” (Acts 17:11). When they saw that “these things were so,” “Many of them therefore believed, with not a few Greek women of high standing as well as men” (Acts 17:12). The Bereans were a bit skeptical and they didn’t believe everything they heard, and by the way, that’s good, so that’s why the Bereans wanted to see if Paul’s teaching was true by checking it against the Scriptures. Sure enough, Paul was right. And knowing the Bereans, they wouldn’t have been shy about telling Paul he was wrong! That’s why many of the Bereans trusted in Christ. They examined the Scriptures, proved that Paul was right about Christ, and as a result, many were saved, so there is absolutely nothing wrong about checking Scripture to make sure something is true or not. If it’s not, you’ve got to speak up. You cannot be silent. That is a sin of omission. Be the Berean! The Apostle Peter tells us that we must be ready to give an answer for the hope that is in us, but we must do it with gentleness and respect (1 Pet 3:15). This means we must not be argumentative. You can win a debate but lose a friend, and no one that I know of was ever argued into heaven, so in the same way, if you know a pastor or Sunday school teacher is wrong about something in Scripture, go up to them privately and express your concern. Don’t go before others or the congregation until you speak to the person privately, and do it with respect. Keep this between you, them, and God alone. If that doesn’t work, then we must follow the biblical model and bring another witness or two (no more!) and go to them (Matt 18:16). If this doesn’t work, and the person is allowed to continue teaching error, then it’s time to bring it up before the church (Matt 18:17-20). Even though the context of Jesus’ teaching was about a sinning brother or sister, teaching biblical error is still sin, and even if the person doesn’t know they’re teaching error, they must be told about it and it must stop. Jesus is in agreement for what’s best for the church (Matt 18:20). If the doctrine of salvation begins to include works, then you’ve got an entirely different gospel, and not the one that saves, so we must confront error, but we must do so with gentleness and respect. They may not even be aware of their error, so it must always be done in love, but ultimately, it must be done for the good of the church. Jesus will hold the leadership and the congregation responsible for how His church functions, and we must remember, it is not our church or my church. It is Jesus’ church, and He will hold us all accountable for what we allow the church to teach. Not only should Christians make pastors accountable to preaching the truth, they must hold others accountable too, like Sunday school teachers, associate pastors, youth pastors, worship leaders, elders, deacons, and in fact, all of us. The Bible commands teachers to rebuke, exhort, admonish, and when necessary, correct the body, so even members must be corrected when they are teaching or speaking biblical errors, but none of us can be innocent bystanders. We are all accountable to God if we teach something that doesn’t square up with Scripture, and the pastor is no exception to this, therefore, we must speak up when error is being taught as truth. We have a first obligation to the truth of God’s Word. Jesus said we must worship God is Spirit and in truth (John 4:24). Without the Spirit, you can’t know the truth, but without the truth, God’s Spirit is not in it, so we must worship God in both Spirit and truth. I have told the church many times that if I am in error, they would do me a favor by showing me my error from Scripture. It’s okay…I can handle it. I’d much rather be corrected than be incorrect, especially in matters of doctrine. I don’t want to get these things wrong. These are the very oracles of God. 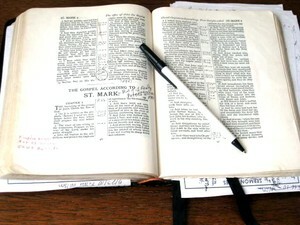 I have an exceedingly high regard and reverence for the Word of God, as I do for God Himself. Having a high view of God’s Word will give us a high or lofty view of God Himself. It grieves me to say it, but there is so much bad theology out there today. And it’s getting worse day by day. As a result, there is a lot of “damage control,” that Bible teachers must do. That means they must undo a lot of bad teachings, but the best way to do that is by expository, verse by verse preaching and teaching from the Word of God. That’s the way Scripture is laid out for us. We are to take the text within the context and not take a text and possibly create a pretext (and one that may be false!). Exposing the church to the whole Word unleashes the power of God that’s found in His Word. It is that kind of power that saves souls (Rom 1:16; 1 Cor 1:18). If I offered you a drink of water, but said, there are only small amounts of contaminants in it, you’d likely say, “No thank you,” and I don’t blame you. Taking a drink of “mostly” pure water won’t do! It must all be pure. Getting most of the truth right is not enough. A half-truth is still a whole lie. Find the truth and it will set you free, and Jesus tells us where to find it, saying, “Your word is truth” (John 17:17b). Jude wants us to “contend for the faith that was once for all delivered to the saints. For certain people have crept in unnoticed who long ago were designated for this condemnation, ungodly people, who pervert the grace of our God into sensuality and deny our only Master and Lord, Jesus Christ” (Jude 1:3b-4). You and I are on guard duty…guard the truth and contend for the faith once delivered to the saints. Contending for the truth doesn’t mean being contentious, but it does mean speaking up…even if it’s the pastor. Thank you Pastor Wellman! I hope many take to this lesson today. It is needed. As a pastor I encourage my flock don’t just take what I say for granted. Check it in God’s Word. Only Jesus was perfect. I am not… There is a lot of theology that is being taught wrong these days. And too many people are following the “man” and not Jesus. Truly appreciate your writings. I only found you a few weeks ago. Glad I did! God bless you sir! Thank you Mr. Martinez. I appreciate that. I have no power. God’s Word and God’s Spirit does. We must utilize what already works and is not broken. God bless you sir for your encouragement (like a Barnabas!). I am very surprised that you don’t know that Joel Osteen is a False Teacher/Preacher!! You are advertising of him giving his farewell speech. He is about wealth and health. He doesn’t preach the Gospel of Jesus Christ. He preaches about what God can do for him and not what he can do for God. Hello Ed. Yes, we are aware of this man’s false teaching, so why would you say that based upon this article? Not sure why you did. I am surprised to that you are angry at us for not mentioning him by name when he fits right into the false teachers/preachers. to learn everything about False Teachers, Preachers and their False teachings. I spread the word about them to other Believers. I read your article and I enjoyed it. If you happen to have articles about false teachers, I would like to read them. Thank you!! God bless and take care!! Previous post: What is a Spiritual Debtor?